Please be invited to enjoy Northgerman haute cuisine! You can order all dishes from Wehmanns menu as an à la carte portion. You can order all dishes from the Classic's set meal à la carte as well. We are happy to prepare all our dishes as a vegetarian and vegan alternative. Please let us know if you like to order our meals as a vegetarian or vegan dish. Here you can find more information about our different sections of the menue. You can also have a closer look at our menues-archive. Just click on read more. The restaurant Landhaus Scherrer recently changed the menu. But you dont need to worry about the old classics you always had in restaurant Landhaus Scherrer, because you will still find them. The target of the change was to create a classics menu because many guests asked for a classics menu with all those delicious dishes Heinz Wehmann created over the years. Another target was to be more creativ and regional with the daily menu and our recommendations. On behalt of many guests, Heinz Wehmann created a classics menu with all those dishes that most guests loved over the years and some guests only come for those classics into the restaurant Landhaus Scherrer. So you may choose the turbot or regional cheese dumplings, and from now on you may also have the crispy nothgerman duck as a menu portion. For this classics menu it is worth to come to the restaurant Landhaus Scherrer, if you wish even including wine, water, coffee and digestiv from sommelier Erik Merten. The orientation of our recommendations is the saisonal calendar in order to draw attentions to the fresh regional products. Every two to four weeks our recommendations will change, all in coordination wir our poultry-, vegetables- and fruit-farmers. This menu changes, as the name shows, on a daily basis. 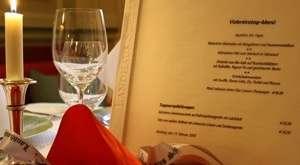 So you are able to come serveral times a week to the restaurant Landhaus Scherrer and find different menus every time. Also, chef Heinz Wehmann is able to show his creativity and draw attention to the regional and saisonal products with new ideas and experiments. So don't be surprised if the classical order of courses is rearranged or insted of an sorbet you get served a shooter. Do not forget to have a look at our menue-archive. Here you can book our special menues and events.